Do you have some business photos that you would like to highlight in a presentation or post on your company’s website as a video? Or perhaps you just want to show some friends your personal photos. Either way, you can use PowerPoint’s Photo Album feature. This feature has existed since PowerPoint 2003. In PowerPoint 2010 and 2013, you can go one step further and convert your photos to video format. Select the photos you want to include. You can press Ctrl + A to add all of the files in the folder. To select a range, click the first file, press Shift and click the last file. To select individual files, pres Ctrl and click each one you want. When you’re done, click Insert. 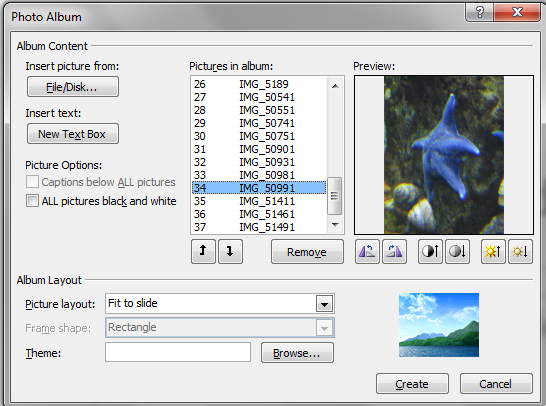 You now see the images listed in the Photo Album dialog box. You can select a photo and click the up or down arrows to rearrange them, but it’s easier to rearrange them in PowerPoint later. You can also use the Rotate, Brightness, and Contrast buttons to modify any photo. In the Album Layout section, you can leave the Fit to Slide default or choose another layout, such as 1 Picture (which doesn’t expand the image to cover the entire slide) or more pictures per slide. If you use one of these options, you might also want to use a theme, since your slides won’t be entirely covered with a photo. In the same Album Layout section, click Browse. Note that vertical photos, like the one you see below, also won’t cover the entire slide. Also, the first slide doesn’t have a photo, although you can change that–I usually delete the first slide. Click Create to create the photo album. Here you see the result in Slide Sorter view. 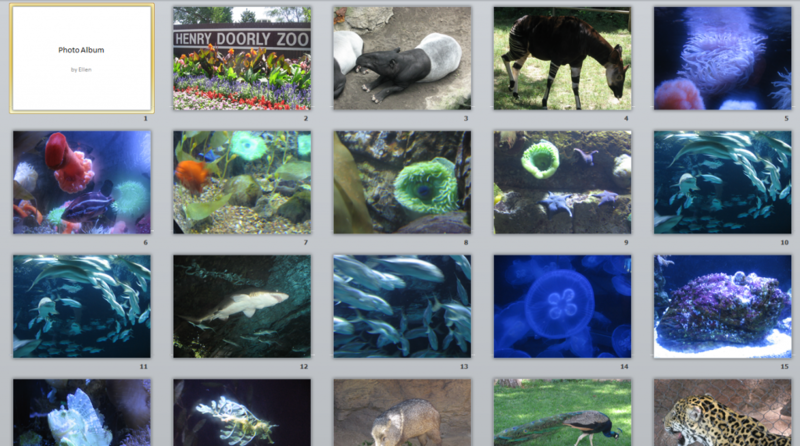 These are photos I took at Henry Doorly Zoo, a great place to visit in Omaha, Nebraska! Feel free to re-order the slides, which is easy to do in Slide Sorter view. Just drag the slides where you want them. I’m not usually a fan of transitions, because I think they’re distracting. You need a real purpose to use a transition. In this case, entertainment is a good enough reason. I chose Cube for all the slides, which is a 3D transition new to PowerPoint 2010. It’s pretty dramatic, so use it only when you think it’s definitely appropriate. You can add music if you want! To insert and play music throughout a presentation, see my PowerPoint tip, “Play music or narration throughout a presentation.” However, finding free, legal music isn’t easy. I left out the music. 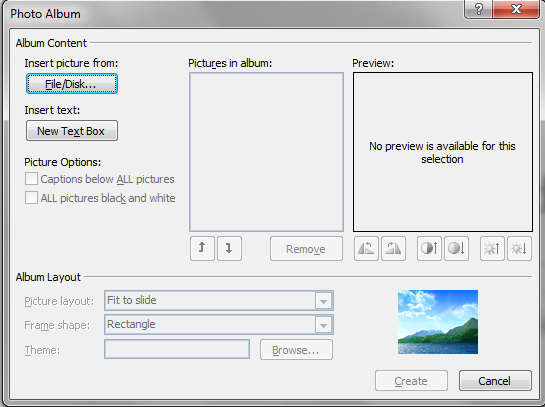 To create a video in PowerPoint 2010, choose File> Save & Send> Create a Video. Check the settings on the right to make sure it will pick up your slide timings. Then click Create Video. Wait while PowerPoint outputs the video file. Here’s the result. Each slide displays for 5 seconds; the entire presentation is just over 3 minutes long. Enjoy! Nice post and thanks for the information. There is a lot of public domain music out there that I use in various audio projects. An interesting one is this http://incompetech.com/m/c/royalty-free/index.html?genre=African – the navigation isn’t the best, but you can browse by genre and feel from here. The music is very good. Is the sound from a separate sound file that you inserted? Is it on the first slide?